Tue., June 3, 2014, 9:30 p.m.
James Ruffin doesn’t work 24-7, but he’s not far off. Ruffin is a record-setting defensive lineman for the Spokane Shock who occasionally squeezes in a workout before practice begins on weekday mornings. Then he showers, puts on slacks and a tie and heads off to U.S. Bank, usually from 1:30 to 7:30. It’s not a stretch to say Ruffin works mornings, afternoons, evenings and weekends this time of year. When the Shock play a Friday home game, there’s a pretty good chance Ruffin will work Saturday and/or Sunday at the bank. Spokane leaves Thursday for a Saturday afternoon game at Jacksonville. “Since I’m a full-time employee, I’m able to use my vacation days for (road) games and make up time on the weekends,” he said. Ruffin is one of maybe a handful of Spokane players with in-season jobs. AFL veterans make $830 per game and can make additional money depending on bonuses or length of contract. Ruffin has deposited numerous quarterbacks on their backsides this season. His 9 1/2 sacks is a Shock single-season record and there’s still seven regular-season games remaining. He also holds the Shock career record with 21 1/2 sacks. 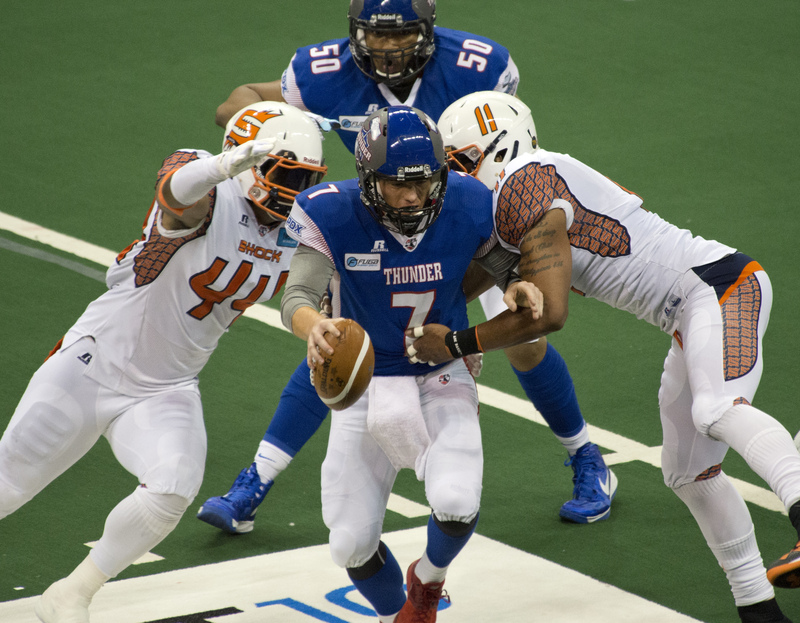 Spokane leads the AFL with 26 sacks. Derrick Summers has 6, Terrance Taylor 4, Jeremy Geathers 3 1/2 and Diyral Briggs 2 1/2. Ex-Shock linebacker Beau Bell, now with L.A., has a league-leading 11 sacks. “Last year in the offseason signing Jeremy gave him some motivation,” coach Andy Olson said. “A couple of guys have always felt Jeremy is the No. 1 and James is the No. 2. It’s nothing personal, just friendly competition. He worked harder in the offseason than he’s ever worked and you’re seeing the results. AFL rules don’t make that an easy pursuit. Linemen aren’t permitted to stunt or twist. They must rely on strength and quickness to win their one-on-one matchup and quarterbacks often use quick releases on three-step drops. Ruffin said his two jobs occasionally intermix. Defensive back Paul Stephens is back with the Shock after getting released by the B.C. Lions on Sunday. Spokane traded for Fred Shaw last week, giving the secondary two 6-foot-plus options. Shaw is 6-2, 220 pounds, nearly the size of linebacker Terence Moore, and Bryant Nnabuife is 6-1 and 195. Offensive lineman Patrick Afif recovered quarterback Brian Zbydniewski’s fumble in the end zone for a touchdown against Portland, his first TD since his rookie AFL season with San Jose in 2007. “Tight end screen,” Afif recalled of his first TD. “Coach had literally said that week he wasn’t going to throw me the ball and then they threw me the ball in the end zone.” … Jarrett Brown, after a stint on injured reserve, has returned to his role as No. 2 quarterback. Donovan Porterie was placed on recallable reassignment. Published: June 3, 2014, 9:30 p.m.